Homeschooling can wreak havoc on your health if you aren’t careful. You know it and I know it. 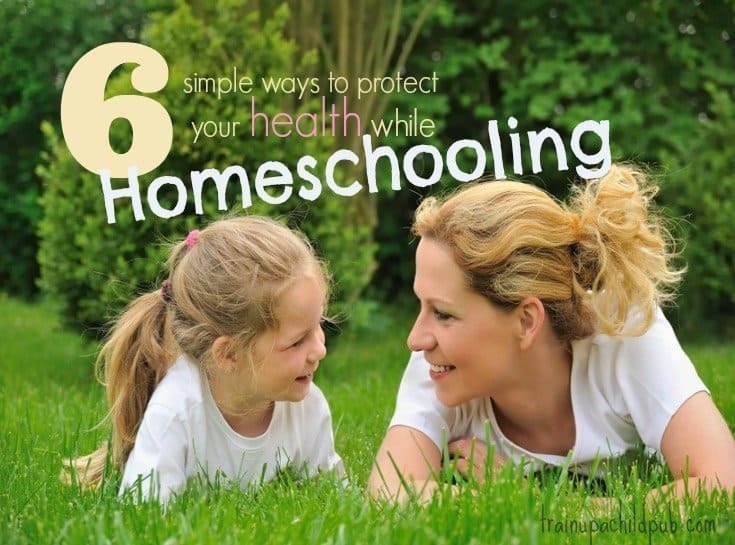 Keep reading for 6 simple ways to protect your health while homeschooling. You’re tired most of the time. Your kids and your husband ALWAYS come first. You look around and see all the things that need to be done, if you just had a little more time. A little more energy. You’d like to be spending more quality time with your husband, if you weren’t ready to drop once the kids were in bed. You feel stretched like a rubber band nearing its breaking point. Anybody who knows me well knows I AM NOT A MORNING PERSON. In fact, once I sucked down an entire cup of coffee made with SALT WATER and didn’t even notice until I got to the second cup. I used to stay up late getting school lessons ready and then get up early, hours before my kids, just to be awake and coherent enough to be the parent. Now most moms with babies are in not-enough-sleep mode for perhaps a few months at a time, but moms of homeschoolers may live in this state for decades! There is ALWAYS more to do than is humanly possible. And we have pretty high standards when it comes to our kids’ education, don’t we? Standards that we generally feel we aren’t meeting, which adds even more stress. Stop taking care of everyone without taking care of yourself. If you don’t take care of yourself you are not going to be as effective taking care of everyone else! And if you are still resisting, let me re-frame this for you: shouldn’t you be a good role model for your kids of a balanced, healthy lifestyle? Of course! When you can get that 7-8 hours, do so – even if you don’t have all your lessons together. Instead of waiting until the night before, plan at least a week of school at a time, on the weekend when your husband (or a sister homeschooler) can take your kids for a few hours. If you can’t get enough sleep at night, work on taking a nap when the kids are taking theirs or when an older child can supervise. It’s tempting when the kids are sleeping to do something productive or fun instead. But first get enough sleep. Sitting is the new smoking. If your kids are past the infant/toddler stage, you may need to work at getting up and moving more. Ideally, hit the gym, jog, or go for a long walk. If you need to supervise the kiddoes, put on some dance music (maybe a little heavy on the base notes) and DANCE with your kids or clean the house as fast as you can, with a few extra trips up and down the stairs if you have them. If you make a point of moving almost daily to the point of sweating, even when it’s the last thing you feel like doing, I promise you will be happily surprised at the new spring in your step. If you can, get outside for a walk by yourself – God’s creation is unbelievably relaxing, even healing. If you need to bring the kids, take a nature walk. Stop and sketch what you see around your yard or a local park. Just eating your peanut butter-and-jelly on a blanket in the backyard is a pleasant break from being inside all day. In fact, you can discuss the Civil War, listen to narrations, or do a lot of other schoolish things outside instead of inside! Varying your routine to add more time outdoors is refreshing and healthy for everyone. Get smart about your eating and drinking. You look for sugar and carbs for quick energy when you’re run-down, but they are just good for a rush and then it’s back to as-exhausted-as-usual. If you drink more water and eat more fresh vegetables, less refined sugar and carbs, less processed red meat and more chicken and fish, you will FEEL BETTER. I know veggies are a pain to cut up, so do it in batches. Cook a big pot of veggie soup or chili a couple times a week so you have some left-overs. Make meals and snacks healthy and trade regular AND diet soda for water. You’ll be doing yourself and your kids a favor, you’ll think with more clarity and be lighter to boot! Get consistent about your quiet times. How does Bible time help your physical health, you ask? Not only does regular Bible and prayer time help guide you as you guide your kids, it also helps give you a healthy perspective on life. It eases your stress. It helps you get a glimpse of the big picture, rather than worrying about the less-important details homeschool moms tend to focus on. What’s the opposite of worry? Worship. It works every time. This is the hardest one of all to achieve, but mom you are so worth it. Pay a babysitter, enlist your husband’s help or trade child-watching time with another homeschool mom and get some time away. A biweekly mom’s night out with friends or even drinking coffee and reading at a Barnes and Noble by yourself is invigorating and restorative. If you have the means for an occasional pedicure, massage or even a weekend with girlfriends, DO IT. None of this is rocket science. You’ve read and heard it all before. But it takes determination to actually do it. Put these six simple steps into practice regularly. You’ll be amazed at the difference they make! Tell me which one you would like to do first and what change you are hoping for in the comments! Thank you for the reminders! I definitely need to get moving and get outside more. It would definitely benefit not only me, but my kids. Hi Katie, I know what you mean! It’s refreshing and you feel better, but it’s hard to think about adding in ‘something else.’ It’s worth the extra effort, though! Go for it! Thanks for sharing. I love these suggestions! Although it is not ideal, I am taking care of myself this year by sending my oldest two to our church’s school. I am recovering from a broken foot and two of my other children have upcoming surgeries, so I am letting go of the homeschool reins for one whole year and I just know I will come back rejuvenated and with plenty of new perspective for next year! As a side note, I think as homeschool moms we feel so indepedent. It has been very hard for me to accept help while I recover, and God is using all of those kind offers to mold my prideful heart quite a bit! My biggest recommendation is if a mom is ever in a situation where help is offered her, humbly accept it and see how God works! Hi Samantha! It sounds like you definitely have your hands full this year and you’ve made a difficult decision looking at the big picture. Good for you. I so agree about how independent we are and how difficult it is to accept help — we are usually the helpers, not the “helpees,” right? Thank you for your wise advice about accepting help when needed. Praying for complete healing for your foot, and in advance for your two children’s upcoming surgeries this year. Thanks for sharing! I love this article!! My SAHM friend and I swap off taking turns watching each other’s kids on Wednesday mornings. It’s a nice break!! I also try to eat a balanced diet, drink my Shakeology, and workout for at least 30 minutes a day!! It’s really changed my life. My quiet time is what I’m worst about, but I do know that I am a much more peaceful wife & mom when I do it regularly!! I need to be better about this!! Thanks, Allison! Good to hear from you and glad you liked the article. That’s great that you have arranged kid-swapping once a week. As much as we love our children and enjoy being with them, it’s energizing to have a little bit of regular “alone” time. Congratulations on your commitment to physical fitness! You’re such a great example for your kids! I feel SO much better when I exercise daily/almost daily. I am not sure how the timing would work for you, but I’ve always found having quiet times the first thing in the morning to be the most productive, especially if I could get up before the kids. Hang in there! Thanks for taking the time to share your thoughts! You’re very welcome, Cheri. I’d say most of this post applies to home-based business owners like us as well! Thanks for taking the time to visit and share your thoughts.